Food of Gujarat is the oldest culinary treasure of India. The state offers a variety of vegetarian dishes including different kinds of pickles, farsans, chutneys and foods that are always high on nutrition quotient. In the cuisines of Gujarat, one can see that there is excessive of sugar, tomatoes and lemon. The reason behind this is that Gujarat is a coastal state, weather remains hot and dry throughout the year and all these ingredients keep the body hydrated. Cuisines of Gujarat have emerged from the different communities who have settled in the state. Gujarat is divided into four regions- North Gujarat, Kathiawad, Kutch, and South Gujarat. In all these regions, different types of cuisines are cooked because of their climatic conditions. North Gujarat is prominent for its thalis. 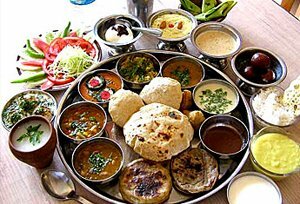 Farsans (snacks) including items like khaman, khandvi, kachori, mini-samosa, dhokla, and dahi vada are the speciality of North Gujarat thali. South Gujarat cuisine is known for its use of chillies in almost every dish. Undhiyu and Paunkh are few popular dishes that are served in South Gujarat. Even the cuisine of Khathiawad is known for its spicy quotient as there is excessive use of chillies here as well. Dhebras (prepared with wheat flour, yoghurt, spinach, green chillies, sugar and salt) served with Chhunda (sweet and sour mango pickle) is loved by the people of Khathiawad region. In North Gujarat and south Gujarat, one can find flavourful delicacies but in Kutch the scenario is a little bit different as a simple meal is served. The main dish of Kutch region is the Khichdi and kadhi or Bajra no rotlo, guvarnu shaak. Somewhere like Rajasthan, cuisines of Gujarat are influenced by Vaishnavism and Jainism. Chances are there that here one can find more of vegetarian dishes served in a sophisticated traditional manner. 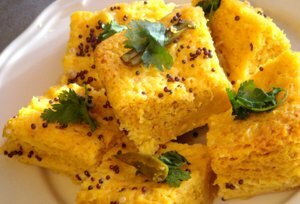 There's something special about Gujarati cuisine, they make their way directly to the heart, whether it's vegetarian or non-vegetarian food. Local food of Gujarat is rich in proteins as there is a use of lentils, cereals and vegetable, distinguished by wonderfully subtle seasoning. Cuisine dishes of Gujarat are a delicate balance of the spices and the sweets and its infinite variety of dishes can be sampled in the typical Gujarati thali. "Gujarati Thali" is a must try for everyone. A typical thali that contains many small bowls filled with curries, snacks, sides, sweets, bread, chutney (spicy condiment) and pickles. Distinctive things about Thali is that it allows you the savour the delicate balances of flavour-sweet, salty, spicy, crisp, soft, fried and deep fried. Bread include the Rotlis (baked bread) made from Bajra (millets) and the Thepla (griddled bread made of chickpea). Khichdi (a mixture of rice and five kinds of lentils), Kadhi (preparation of sweet and spicy curd mixture thickened with gram flour), Masala Bhat (spiced rice) and Vangi Bhat (rice with aubergines and coriander). Jaggery often paired with rice is served as a sweet. Sweet delicacies include seasonal Aamras (mango fool) and Dhoodh Pake, made with thick sweetened milk, dried gruits and nuts. For the snacks, there are crisp Farsans, particularly Dhokla( spongy cake made of chickpea flour and yoghurt), Khandvi (chickpie rolls filled with cocnut slices), Mirchi Pakoda (fried snacks made of chilli pepper) and Khakra (wafers). Also not to forget are the Nankhatais (local biscuits of Gujarat). With all the species, herbs and the flavours, cuisines of Gujarat are worth relishing. They are scrumptious, delicious, yummy and can surely tickles ones taste buds. People who are on a holiday to Gujarat should savour the delicious flavours offered in the state.